This post will briefly show you how to get a root console on the new Philips Hue Bridges (the square ones). It’s rather easy, the only special tools you require are a USB-Serial cable & a torx screwdriver. Pin 5 = TX Out (connect to RX in of your serial cable). This test-point is shorted to GND with a paper-clip or wire. Click image for full-sized to see in better detail. You can now reset the system (use the ‘reset’ command), and confirm there is a count-down that gives you time to hit “enter” and get this prompt again. You may have to copy this into notepad first to ensure it all fits on one line! The quotes are critical here. Again check it works with printenv, then type saveenv to store things to disk. If you want your own password, simply use the ‘mkpasswd’ command in Linux to generate an appropriate string. Once again reset the board – assuming you used saveenv, that root password will be used by the system now. You should be able to log in with root/toor! This will open the telnet port & start the daemon on boot. Write the file and quit with :wq. You may also want to add the /etc/rc.local to the /etc/sysupgrade.conf file to avoid it being overwritten in the future. See the comments below – someone found a way to get ‘dropbear’ to allow root login too. It’s great as SSH is much nicer to work with than telnet! This requires a different password hash than my original instructions/video. I’ve done the 25-July-2016 update without issue too (after first rooting the hub with an earlier version). I’ll continue to update this as updates happen. BONUS – How did I figure this out? This gives me a shell which doesn’t require a login. But many things are broken/disabled in this mode. It was however enough to find that there is another script that runs on startup which uses the uboot env variable, and copies it into the shadow file for the root password. With this knowledge it’s easy to use mkpasswd to make an appropriate shadow file entry. Easy! I also checked with two different Hue Bridge v2.0 devices. They contained different root passwords (at least different salts). I’ve been told the root passwords are indeed unique per device, which is a good step to stop someone from attacking your virgin Philips Hue 2.0 bridge. As an interesting note – other people have also discovered this independently of me. Between writing this post & actually linking it from anywhere (i.e., so you could actually find it) pepe2k figured out the same thing on a forum post. @colinoflynn Nice! I broke into mine by modifying the u-boot env in flash (before first turning it on). I’m guessing your way in was cooler? So it’s worth considering that many devices may be broken even if there isn’t some fancy Black Hat talk or otherwise. Most of the attacks (such as this one) are fairly well-known and pretty basic. UPDATE: At DEFCON 24, I guess someone gave this type of attack a marketable name. 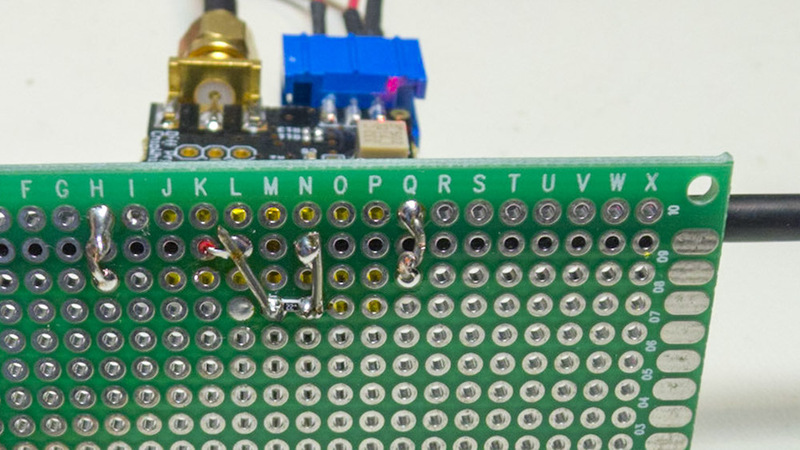 You can see the idea called pin2pwn here. 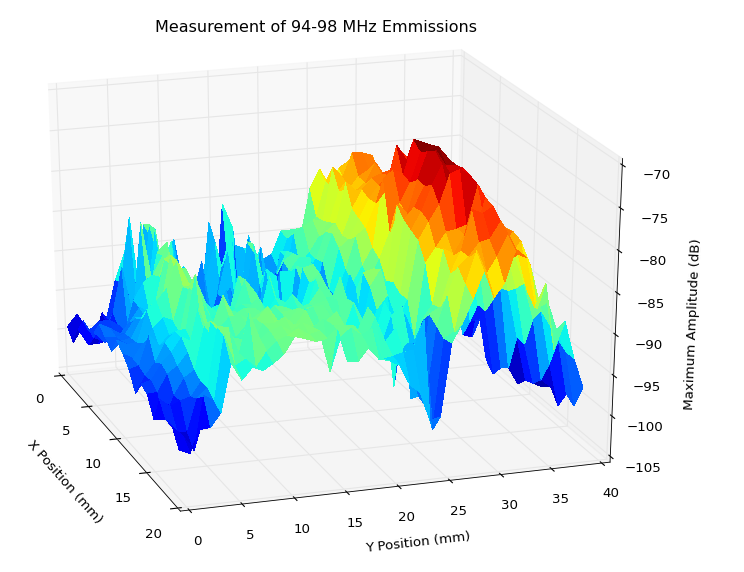 We’re using it to measure EM emissions frequencies over a PCB, but you could also use this for side-channel emissions, or fault injection. While the resolution might not be high enough for getting at specific features on a chip surface, it can still be used for general positioning. 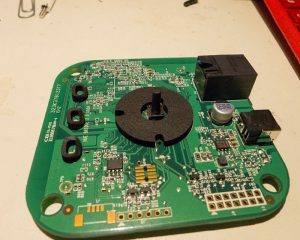 The following blog post shows some details of my SMD soldering process. This was based on a larger video I did (linked below) showing the entire soldering process. The following shows me soldering a complete board with BGA device. In the above video, there are several pieces of equipment used. The following shows you some of the important ones. I’m using a T962A reflow oven. I recommend this over the T962, which is a smaller version. The T962A has 3 heat lamps so has a more even heat distribution. 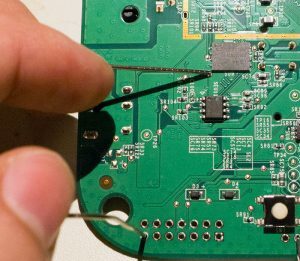 Be aware you can’t use the full surface area – about the middle half I find is successful, but depends a little on complexity of the PCB. Removing masking tape, replace with Kapton (Polymide) tape. See instructables post for details. Fixing missing ground connections. Some versions have poor grounding between the outer (metal!) case and the wall plug. See the wiki page for a photo of this fix. 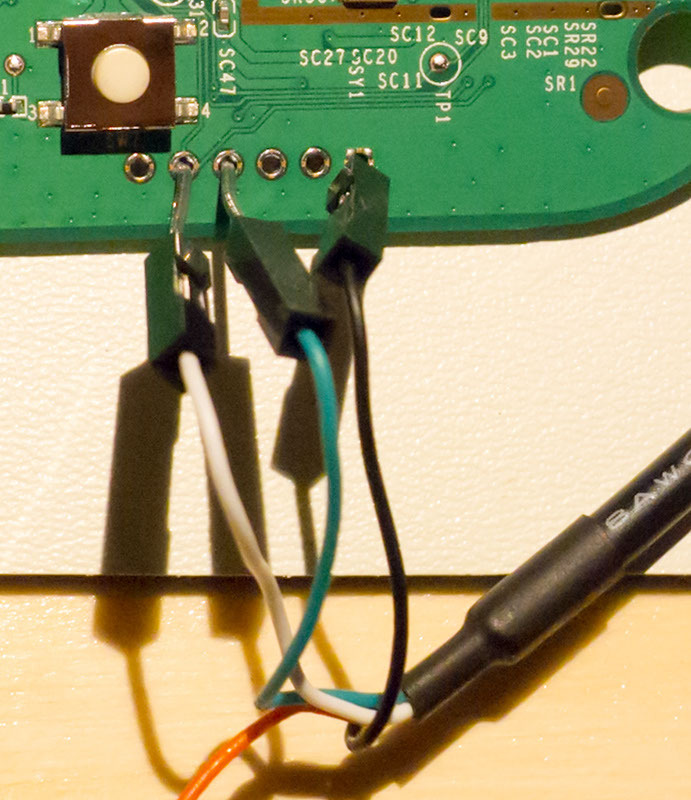 Updating the firmware and adding a cold-junction sensor. This is the most complex task, and requires soldering a DS18B20 to the mainboard, then using a USB-Serial adapter to reflash the firmware. 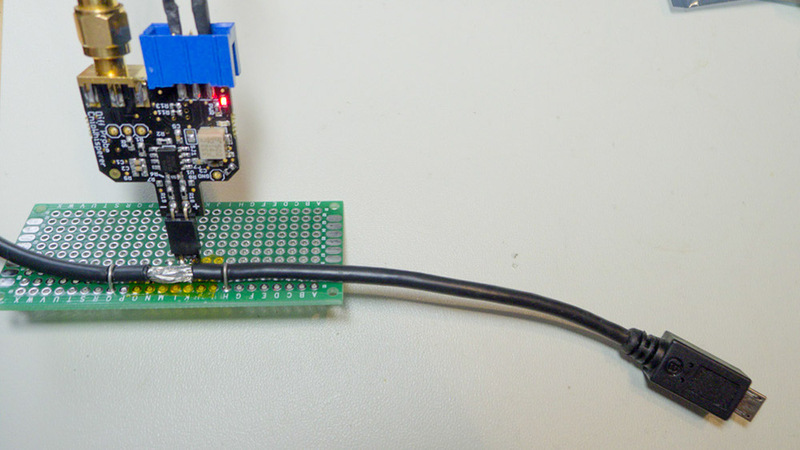 See the front page of the T962-Improvements Github Repo, which has links to the required soldering. There is also an optional fix to reduce the very noisy small fan. Powerful vent booster fan with variable speed control. Active charcoal oven range hood filter (mounted in top of fume hood). Active charcoal filter for car cabin (mounted in cardboard box used as exhaust). You can also improve one out of a range hood from an oven. See video for general fume hood construction. Vacuum pump, which you can make from a Tetra Whisper pump (see instructables link). Get some of the nice silicon tubing at the same time (like $3 from Amazon). Syringe with hole drilled into body. You can get syringes (don’t need the pointy bit!) from pharmacy, or order from Newark/Digikey. When you cover the hole, you force the vacuum through the tip, picking up the part. Release your finger from the hole to drop the part. See the above video for details. The tips for pick and place, which are “Luer Lock” needles bent slightly (for small parts) or commercially available tips (for larger parts). You can also buy Chip Quik Inc part #VCS-9-B which has a bunch of these tips. It’s not the cheapest way, but if you are in a hurry will do! But all of these tips are for larger parts (i.e. maybe SOT23-3 at smallest). If you get into chip resistors, you need to go smaller. For the small parts, you can bend “needle tips” slightly. You can buy packs of 50 from Digikey (search “Luer Lock”), but might find it cheaper to get individual ones from either medical supply places, or buying products which use them. For example some static-safe squeeze bottles come with a few tips. Again the expensive but easy route is Chip Quik part # SMDTA200 which has a bunch of different sized tips. For laser-cut stainless steel, this can typically be ordered with your PCB fab. For example 3PCB.com and Dirty PCBs offer them very cheaply (~$25) when ordering PCBs. This is almost always the best choice, as the stainless steel stencils are very reliable and I’ve had great success with BGA devices. You can also use third-party services to cut Mylar or Kapton film for you. OSHStencils is one example of a supplier. Finally, you can make your own. 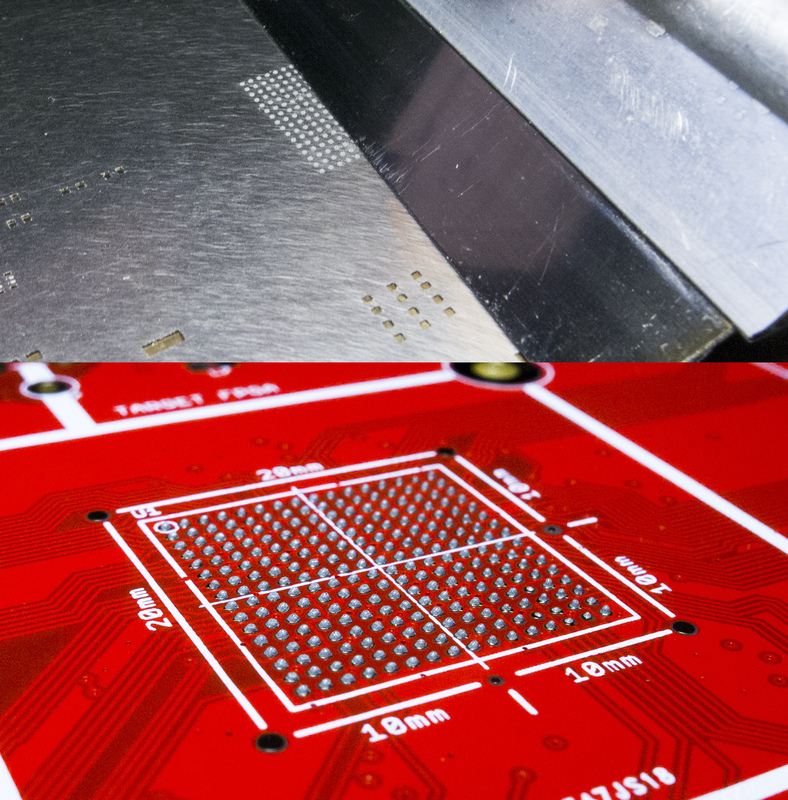 You’ll need some practice to cut BGA parts, but it’s quite easy to cut stencils for less demanding applications. I have a previous blog post on my method. I’ve been making my own stencils with this process for some time with great success. I purchased the squeegee from Dirty PCBs. There are some other blog posts on squeegee options you might look at. I generally just buy solder past from Digikey. Digikey does a great job of cheaply shipping to Canada, and the paste comes in an awesome cold pack thingy that keeps it cool during the trip. Chip Quik (again with the Chip Quik sorry, I don’t have a connection with them but just end up using their stuff!) sells some nice small syringes. Be aware it does have a shelf life… I’ve used past about 6-12 months paste that date, but you will eventually see issues (balling, flux separates). I recommend keeping to the suggested date to avoid giving yourself the headache of discovering your paste is bad after you’ve tried soldering your PCB. The cost of all your parts is probably a lot more expensive than the cost of replacing your paste. See information about the entire project at www.ChipWhisperer.com too! Video will be posted online at some point too. See information about the entire project at www.ChipWhisperer.com too! At ESC 2015 SV I gave a talk on using USB From Python, see the talk description here. This blog post is serving as a placeholder to allow me to update links to software used during the live demo. For SuperCon 2015, there is a Project Page with these details too. You can also ask questions on the project page. There is two versions of the slides. Use the SuperCon slides, but I left a copy of the ESC ones here in case you wanted the original for some reason. For ESC I used a SAMD11 device, which needs a bit of a hack. 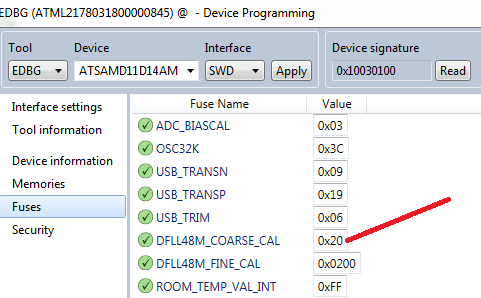 There is a bit of an “oopsie” in the SAMD11 devices. This bug isn’t in the official errata yet, and I’ve been told it’s limited to engineering sample devices (which were used in some of the early dev boards). If you get “None”, make sure you installed the “Filter Driver” using the LibUSB tools! You can read a quick overview on various news sites, but basically project vault gives you a cryptographic module that you have complete control over. This means *you* decide to trust the module – even to the point of being able to access to implementation details of the crypto cores. Basically Project Vault is a solution to how you can avoid having unknown backdoors in your hardware. Rather than having to trust some vendor of security modules, you can make sure things are done correctly. 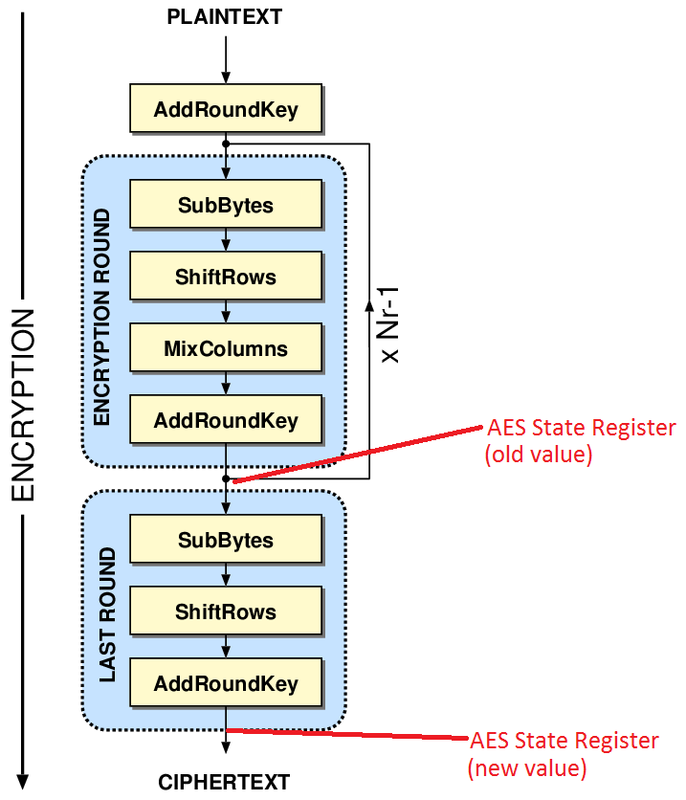 The AES core can encrypt and decrypt blocks of data in three modes of operation: AES-128, AES-192, and AES-256. The design is based upon a purely gate logic implementation of the forward and reverse sboxes due to the work of Boyar and Peralta. This avoids differential power attacks present in purely lookup table or SRAM based sbox implementation. The paper in question isn’t written by Andy Samberg’s character on Brooklyn Nine-Nine, but instead is referencing A small depth-16 circuit for the AES S-Box (that link is the unpaywalled version, the paper was published in the SEC 2012 proceedings). This is a problematic statement, as side-channel power leakage isn’t just one simple fix. 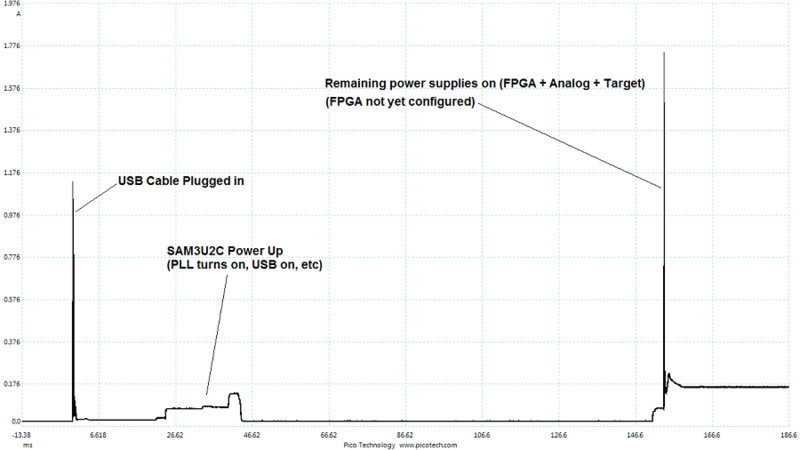 In this case there is effectively no difference from an unprotected implementation for side-channel power analysis. More on that in a moment. It’s worth pointing out I’m looking at a single small part of the entire device. There may be additional protocol-layer protection that would significantly complicated the analysis I perform, I just have no idea as haven’t looked into that. 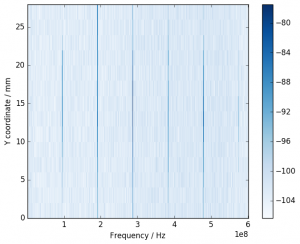 Realistically, side-channel power analysis might be a threat. Having a leaking core on it’s own might be impossible/very difficult to exploit due to use-cases. But it might form part of a larger attack (i.e. someone is able to take control of the core using a different attack method). Side-channel power analysis (or Differential Power Analysis, called DPA) also requires the device is operating with the key we are using. You cannot use DPA on an encrypted hard drive sitting on the table for example – you could only use it to recover the encryption key as the drive is decrypting/encrypting something. If the encryption key comes from the user, this means DPA is useless against an encrypted drive you recovered from someone. DPA attacks are based on small power measurements being correlated with either data values or changes in data. In the referenced paper from earlier, the DPA attack being prevented is that the input and output of the S-Box are never put onto the same register. This means we could never see the difference in number of bits flipped from input to output of the S-Box. Thus the power analysis attack on the S-Box itself would fail, which is normally where an easy leak to stop is. But it’s not the only way. The ShiftRows is easily reversed (it’s just swapping around the location of bytes). This in fact means the input and output of the S-Box is effectively written into the same register, giving as an easy way to count bit flips (Hamming Distance). 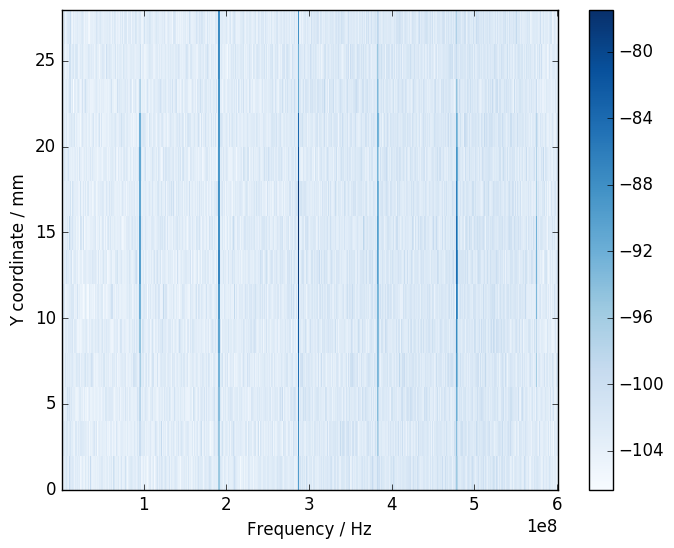 We can correlate expected number of bit transitions with measured power as in a standard DPA attack. You could easily use my ChipWhisperer-Lite with any other FPGA board instead of the SAKURA-G. The SAKURA-G makes power measurement easier, otherwise you can use some H-Field probes etc. There’s not a lot to this – I ripped out just the AES core (i.e. everything in this directory in the GIT). It’s easy to interface to the existing FPGA code given with the SAKURA-G, as the interface is almost exactly the same (key in, block in, block out, clk, go command). That’s it! It’s really a standard Hamming-Distance attack against AES. The special S-Box design didn’t make our life any harder for my attack. Again this was done in a controlled environment, so it’s quite possible there are higher-level protections that make this attack much much harder. Considering the device will (presumably) only have the encryption keys loaded when the user is doing stuff, it’s a pretty small risk. An attacker would have to monitor the power while you are using the device to deduce your keys… and if they are that close, they might just try seducing you instead. To get that lens, I purchased a 20mm diameter ZnSe Lens with 50.8mm/2″ focus off E-Bay for about $20. I ended up getting both a 100mm and 50mm focal length to try both. Then you need a holder, which I used one I found on Thingiverse. If printing again I’d try to enlarge the size of the space for the lens – I had to use a knife and considerably carve the inside step down. In fact I’d remove the middle ‘ridge’ which holds the lens in, and instead epoxy it. I’m using a TO-220 5 ohm resistor, which lets me reliably control the power being dissipated by the device. The part number is PF2205-5R which you can get at Digikey. The vertical mount naturally causes airflow over the large back tab – heat will rise, and as heat comes off the tab, it cause a small amount of natural airflow. The horizontal mounted package is closed to the table surface which will further restrict airflow. The majority of this comes from #1, but people will complain if I don’t mentioned #2. If your heatsinks has lots of fins, it’s worthwhile to ensure the natural airflow due to heat easily flows up the heatsink. 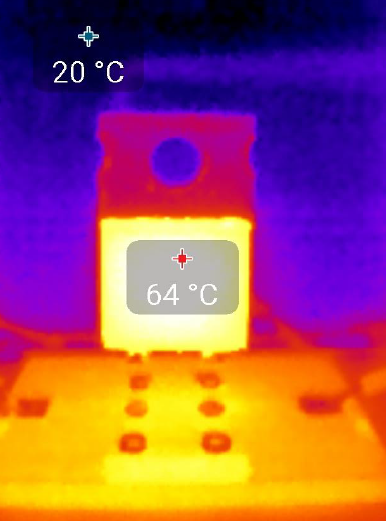 Also note the temperature rise is about what is expected of a TO220 package, which typically has about a 62ºC/W Junction to Case thermal resistance. 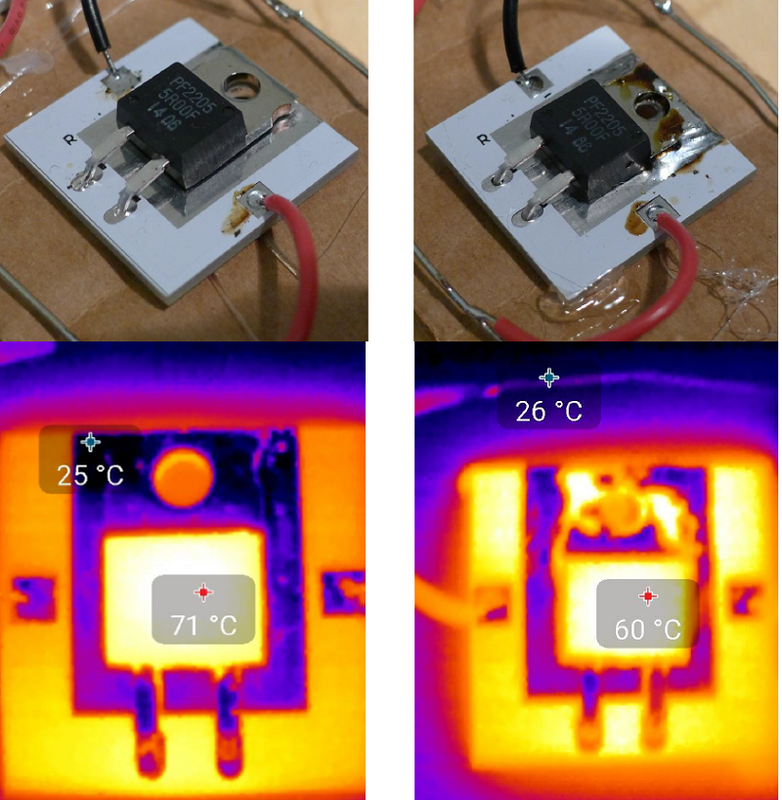 Ambient is around 20C, so with 1W of power in we expect 20ºC + 62ºC = 82ºC case temperature. Cool! What the hell happened? 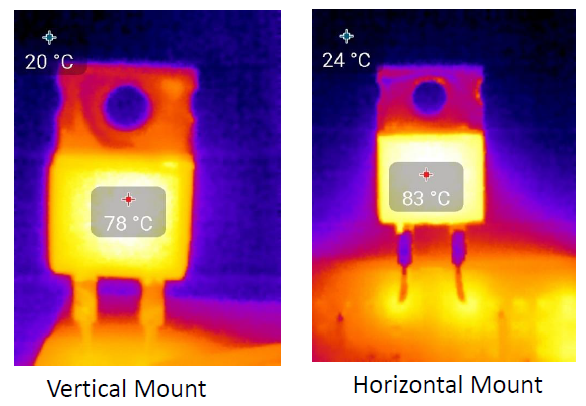 We still had 1W of input per transistor, but it’s 14C cooler than the other test! In this case the PCB is dissipating some of the heat – the entire top and bottom are solid copper pours, each side connected to one of the pins. This is almost idea for heat transfer. 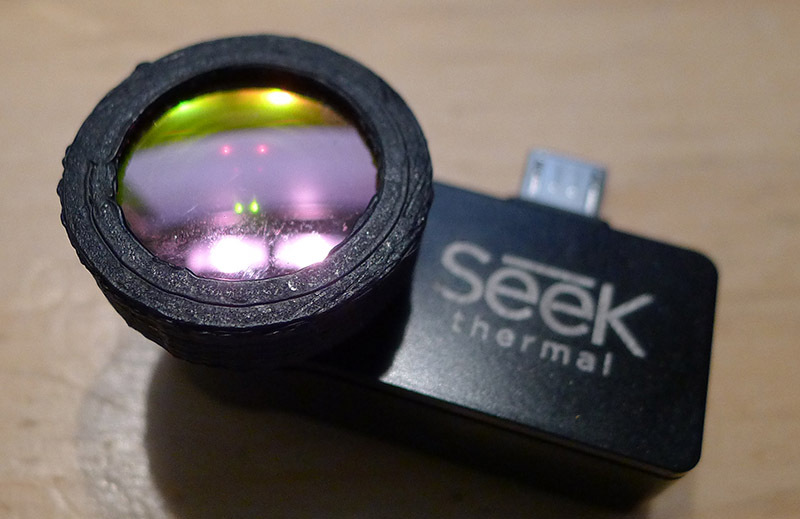 I should mention the reflection areas have low thermal emissivity, and the Seek camera doesn’t pick them up correctly. Thus the tab & PCB area without solder-mask aren’t actually cooler. Anyway you can see that mounting the package *close* to a good heatsink but without actually touching it is worse than free-space mounting. Having a good connection (in this case soldering) as expected further reduces the case temperature by allowing the PCB to dissipate more of the heat. The “close but not touching” comes up a lot – for example if you make a simple metal shield for your device, you might think it a good idea to have the shield come close to heat-producing devices. But unless it actually makes good contact, you are probably hampering the natural convection air currents! When I get some more time I plan on buying a few different heatsinks from Digikey and compare my measured temperature rise with the theoretical temperature rise. The USB spec has limits on the ‘inrush current’, which is designed to prevent you from having 2000uF of capacitance that must be suddenly charged when your board is plugged into the USB port. The limit works out to around 10uF of capacitance . Your board might have much much more – so you’ll have to switch portions of your board on later with FETs as a soft-start. For the ChipWhisperer-Lite, I naturally switch the FPGA + analog circuitry as to meet the 2.5 mA suspend current. 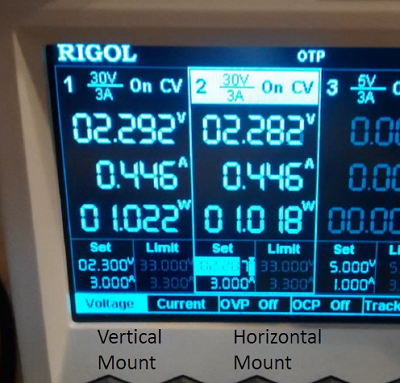 Thus I only have to ensure the 3.3V supply for the SAM3U2C meets the inrush limits, which is a fairly easy task. This blog post describes how I did this testing. 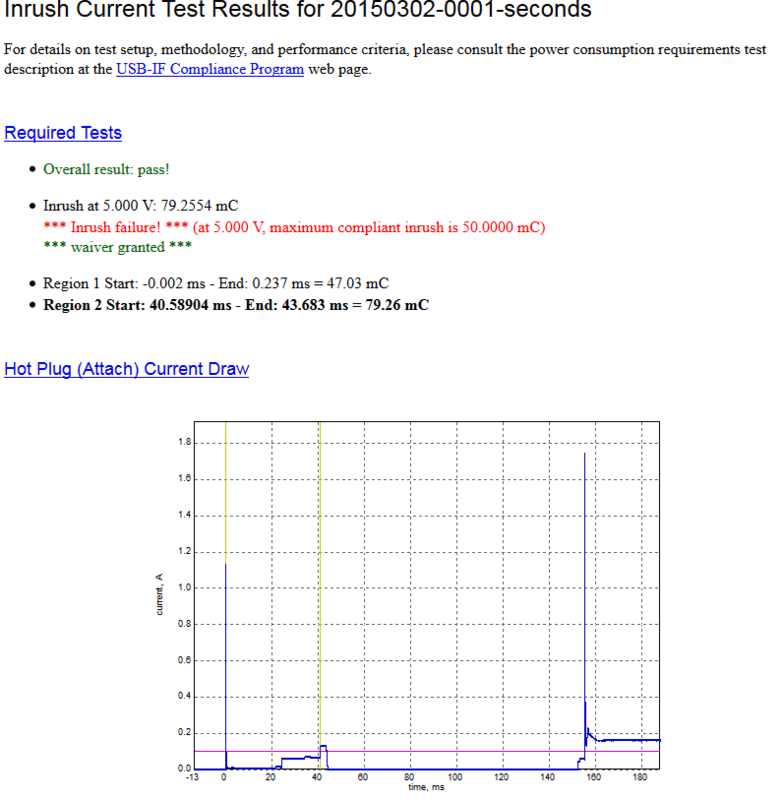 The official USB Test Specs for inrush current testing describe the use of the Tektronix TCP202 which is $2000, and I don’t think I’d use again a lot. Thus I’m describing my cheaper/easier method. 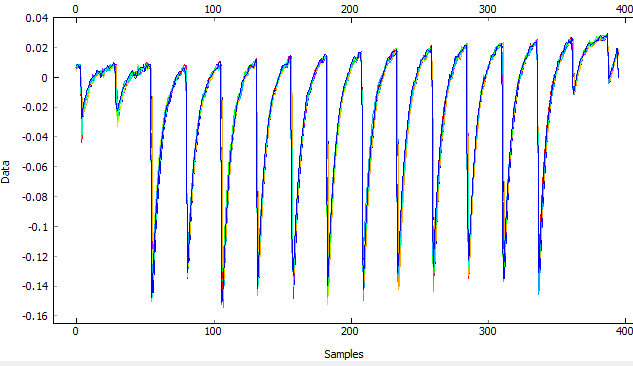 To calibrate the shunt + gain from the diff-probe, I just used some test loads, where I measure the current flowing through them with a DMM. You can then figure out the equation for converting the scope measurement to a current in amps. Note the inrush charge is > 50mC, but there is an automatic waiver for anything < 150 mC. While the system would be OK due to the waiver, I would prefer to avoid exceeding the 50 mC limit. In this case there’s an easy solution – I can delay the USB enumeration slightly from processor power-on, which limits the inrush to only the charging of the capacitors (which is done by ~15mS). This results in about 47 mC. This means I’ve got about 100 mC of headroom before I exceed the official limits! This extra headroom is needed in case of differences due to my use of the shunt for example. If you are in this situation, I wanted to add some of my own notes into the mix. David Grayson has an awesome guide which I mostly followed, available at http://www.davidegrayson.com/signing. Buy a Code Signing Certificate, I selected one from GlobalSign. They will verify your company information as part of this (or name if person) which basically involves calling you. Download the certificate. You can then double-click on it to install it into your system (hint: you may want to dedicate a VM or machine to this to keep your certificate off your laptop you travel with for example). Copy the batch file to the directory with the .inf file, and double-click it. You might need to modify your .INF file, check the output for errors – I had to update the date to be past 2013 for example. The above will work if you’ve installed the certificate on your system, as it will search for a certificate with “Your Company Name Inc.”, so you need to match that exactly. Party – you should now have a signed .cat file! Distribute the whole batch (be sure to remove the .bat file) to your customers/users. The batch file I use above signs both a SHA1 and SHA256 signature. SHA1 is being deprecated due to collision attacks (interesting sidenote: these were used as part of the attack on Iranian centrifuges by creating digitally signed drivers). Unfortunately SHA256 isn’t fully supported across all platforms you might need to support (see https://support.globalsign.com/customer/portal/articles/1499561-sha-256-compatibility), so for now I’m using both, which I think works?